Thank goodness the dreary and cold days of winter are behind us! At long last, the beauty of Spring has arrived and daffodils are in full bloom in my garden. I will spend this special day cherishing the true meaning of Easter - forgiveness, renewal, love, family, friendship, and otherwise counting many blessings I so often take for granted. 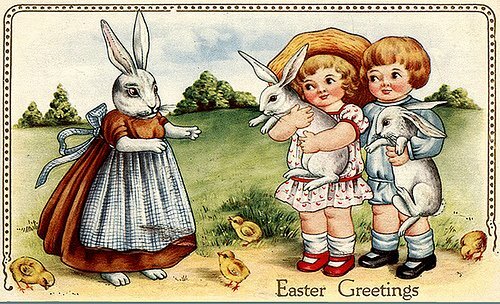 I must confess, I will also miss Easter days gone by, when my own children woke early this day, at sunrise, racing outside with great anticipation, sure to find colorful eggs and other surprises the Easter Bunny may have left behind for them among colorful tulips and daffodils blooming in my old garden. Holidays are simply not the same without children and Easter is no exception to that rule. You can imagine then, how delighted I was when I was contacted yesterday with this very special Spring photo presentation of a little girl in the lavender monogram bishop featured previously in this blog. Easter simply does not get any better than this! Thank you, Sara Gordon, from Sara Gordon Photography, and much appreciation to little Sophia's mom, Meme, for sharing this precious moment with us.